As with any renovation – be it on wheels or fixed into the ground – good bones are crucial. We already loved the layout and how much storage we had, we just didn’t love the dark wood…and the brown and orange striped cushions…and the floral linoleum floor…and the 30 year old green carpet trim…and the fact that we discovered that it used to be brown. 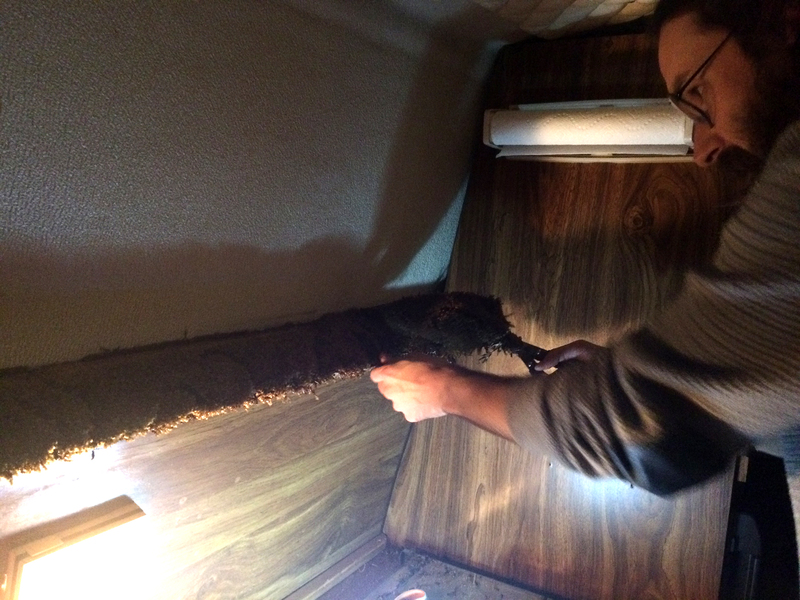 Luckily these were all aesthetic things that we were excited to clean up and modernize to prep for van life. At one point this was the height of style. We started off by staring the green carpet right in the eye. This unfortunate design choice made by the conversion company in the early 80s went almost entirely around the perimeter of the inside of the van to conceal where the high top meets the original van roof. 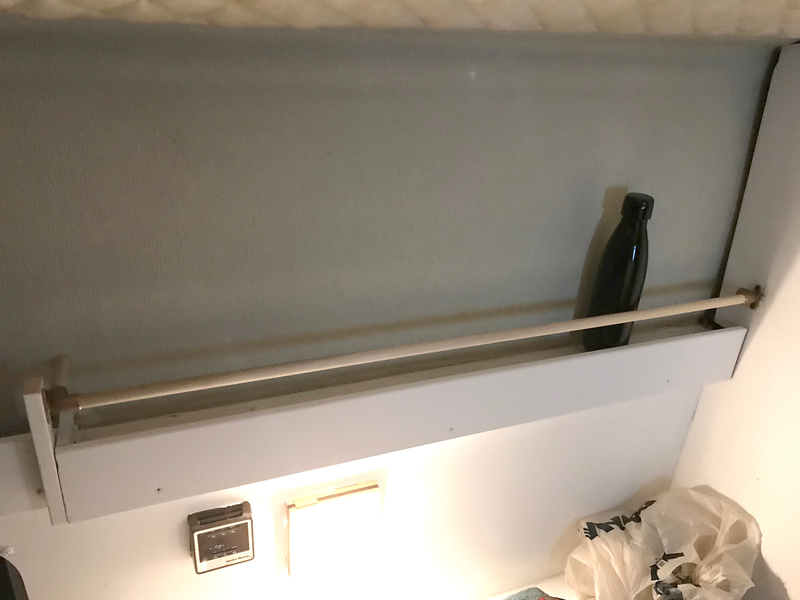 Thankfully, the carpet was attached to pieces of wood that we were able to paint and use a base for our narrow shelf that now wraps the whole living space. 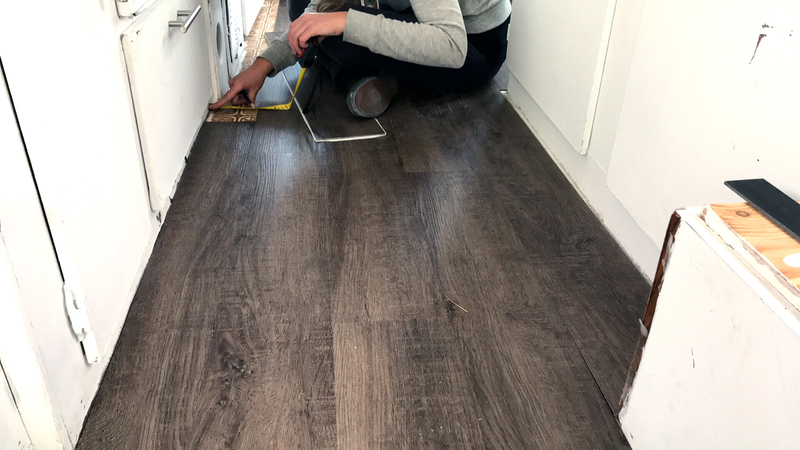 We picked up some MDF baseboards at Home Depot and attached them to the outside of the wood, creating a 2” gap from the wall and enough of a lip that things don’t go flying off of it while driving. It’s just the right amount of space to keep our Bluetooth speaker, some extra notebooks and a deck of cards close by. Originally, we had a bunk above the table/bed area but it was missing a piece so it’d only be useful for a small child with a death wish. Removing the front piece that slid out freed up the back ledge for becoming a great extra storage space for our bedding and linens. 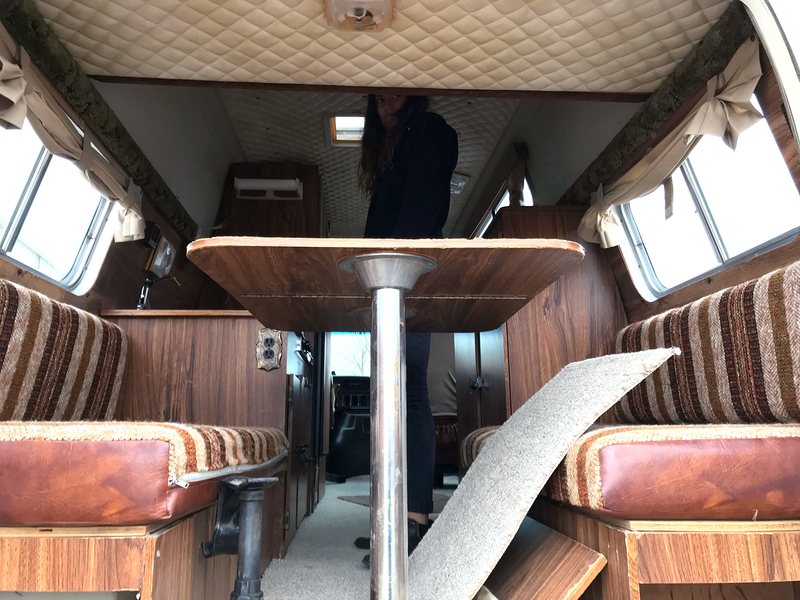 Finding a place to stow away a duvet when you want to sit at the table can be a pain (oh, van life! ), so this worked out really well. We also doubled up on the wood base above the cooking area and used a wooden dowel and some plumbing fixtures to create our spice rack. It’s super handy for storing dishwashing supplies, spices (shocking!) and whatever else will hang on an s-hook. Always a pleasant surprise when you take a look at the carpet behind the wood and it’s a different colour. Then it disintegrates in your hand. Hey, that’s not a spice jar. It fits water bottles too?! How versatile! Carpet surprise #2 arose when we removed the Berber carpet to reveal mint-condition but not quite our style, brown floral linoleum flooring. We had already planned to put down laminate but this discovery really solidified our decision. We opted for a self-adhesive vinyl flooring that was stylish and stupid easy to install. It’s nice and light, easy to cut and cheap (with less than 100 sq. ft. of walking space, we only needed to buy two boxes). We added some additional adhesive in high-traffic areas for extra security and considering our entire renovation was done below 0°C, it’s stuck on there very well. 10/10 would recommend this type of flooring. Lookin’ like a luxurious overpriced condo already. And that brings us to paint. Although it was probably the biggest transformation, it was also the biggest headache. Actually, it’s still an ongoing headache. We used latex paint because there’d be no chance of oil paint drying in our not-so-warm (bitter cold) temperatures. Small anecdote to illustrate the coldness: our paint FROZE in its bucket, rendering it unusable. It also became normal to have to thaw our paintbrushes out before getting started – something all painters face, right? Anyway, the coverage seemed fine until it started chipping like a mother***** with minimal contact from shoes, tools and even fingernails. The fresh white paint also began to reveal oily stains on the fridge and doors. Even with multiple thick coats, there was no hiding them. We’ve decided that we will re-paint the cupboards and doors with oil when we get somewhere warmer. We are greatly looking forward to repainting pretty much everything (sense my sarcasm). Alas, the biggest pitfall of the latex paint was its complete surrender to water. It would be a lie to say we were ignorant to the nature of their relationship, but we thought it would be ok anyway. 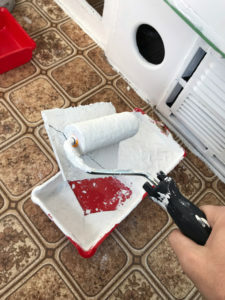 Long story short, we bought a spray topcoat to create a more durable surface for the two countertops to spare us from the tears that ensue when you do the dishes and your countertop peels off – and then more of it peels off from the tear residue. We originally thought we were cool and were gonna do a faux-stone (read: fancy!) effect on the countertops and table but that didn’t pan out so well. It’s hard to find the words to describe how garbage it looked but let’s just say that that spray can should have just stayed at the store. 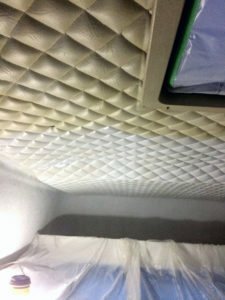 Quilted vinyl ceilings are so hot right now. Our final painting adventure was the most beautiful transformation of all. We always knew that the quilted vinyl ceiling was a tad dingy, but as we began whitening the cupboards and doors, the ceiling and walls became increasingly…yellow. Spray painting was our ticket. With a couple coats on the ceiling and fiberglass walls, it looked so much brighter and cleaner. The fumes were pretty intense but they say the spiritual discovery is worth it. Wait what? With all the major stuff out of the way, it was looking like a new van! 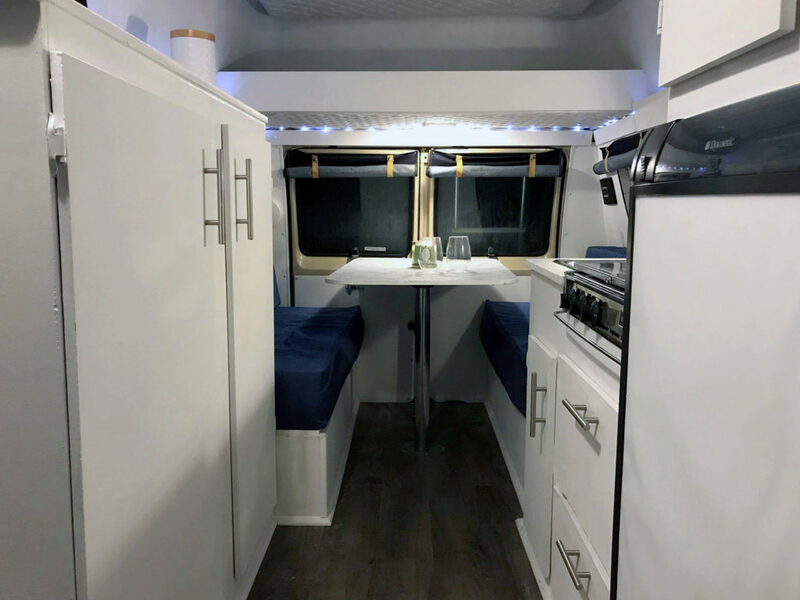 We put up an adhesive subway tile backsplash, added some new shelves into the cupboards and put down new rubber mat flooring in the cab area. The rubber was sold by the foot and cost us 15 bucks so that was the clear choice over custom mats that go for $100+. We are cheap bastards after all. 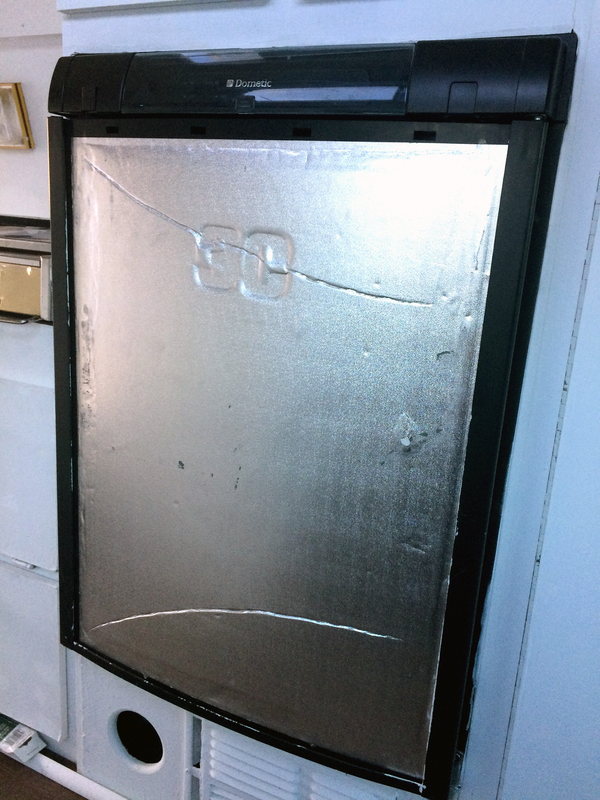 Speaking of being economical, we gave our fridge a quick facelift by removing the wooden face panel and replacing it with some shiny silver gift-wrap from the dollar store behind a frosted plastic sheet. It’s no stainless steel but it’s clean and adds a little twinkle to our otherwise white kitchen. It was a tough decision if we should just leave the fridge with its natural tin foil face…not. Not quite the stainless steel-look we were going for. We decided to preserve the upholstery on the driver and passenger seat because the cushions are comfy and it reminds us of the previous colour scheme of our beautiful 80s rig. This upholstery didn’t stand the test of time on our bed cushions, however. Not to say that they were in bad shape, they just weren’t ideal for Clementine’s new getup. 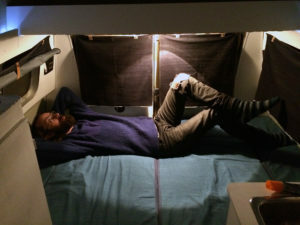 Let’s see a 6″4′ human lay comfortably across a Sprinter! Ha! I sewed up some new cushion covers from different types of denim and a denim-esque duvet cover I found at a thrift store. It just wouldn’t be possible to get that amount of fabric for that price had I bought it by the metre. We ordered a gel memory foam mattress topper on Amazon and put it on top of the existing cushions for a thicker and more comfortable booty-support system and snooze station. Can confirm that memory foam produces an A+ sleep. 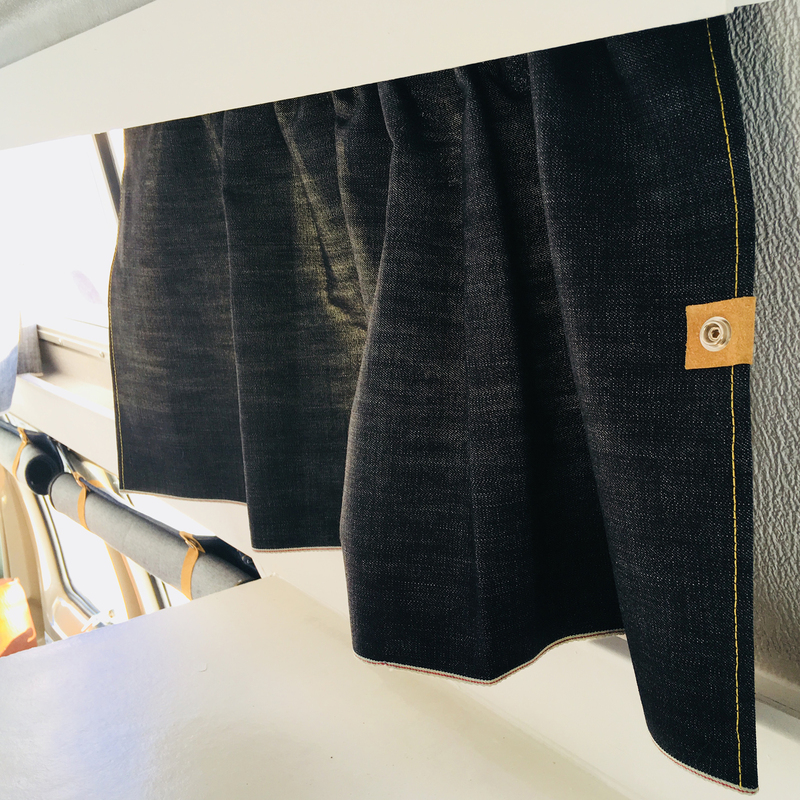 I also sewed up all of our curtains from different types of heavy denim to help keep in heat and block out as much light as possible when they’re closed – magnets and Velcro help to keep them firmly in place. I cut straps from suede and used snaps to roll the curtains up when they’re in open mode. The window on the high top is the only one I opted to dress with a traditional curtain using sash wire. For this I used 12oz. Japanese selvedge denim that a friend brought back from Asia. The selvedge makes a beautiful and strong edge along the bottom. I could speak ad nauseam about these curtains and denim in general, but I’ll save it for another blog post. All in all, we’re super stoked about how everything turned out and are excited to share it with you! Feel free to ask us any questions in the comments or shoot us an email on the Contact page. Let us know if you want to learn more about any aspect of the reno or van life and we’d be happy to do a little write-up on it.